Magic Knights are modern magic-users who fight with weapons converted from their souls. Ikki Kurogane goes to a school for these Magic Knights, but he is the "Failed Knight" or "Worst One" who is failing because he has no magical skills. However, one day, he is challenged to a duel by Stella, a foreign princess and the "Number One" student. In this duel, "the loser must be obedient for life." Where can you stream Chivalry of a Failed Knight? 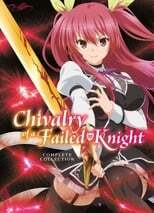 On 2015-10-03 Animation/Sci-Fi & Fantasy TV Series Chivalry of a Failed Knight first aired on AT-X. Written and created by Shin Ōnuma & Jin Tamamura, and produced by Nexus Factory & SILVER LINK., Chivalry of a Failed Knight has ended and last broadcasted on 2015-12-19.